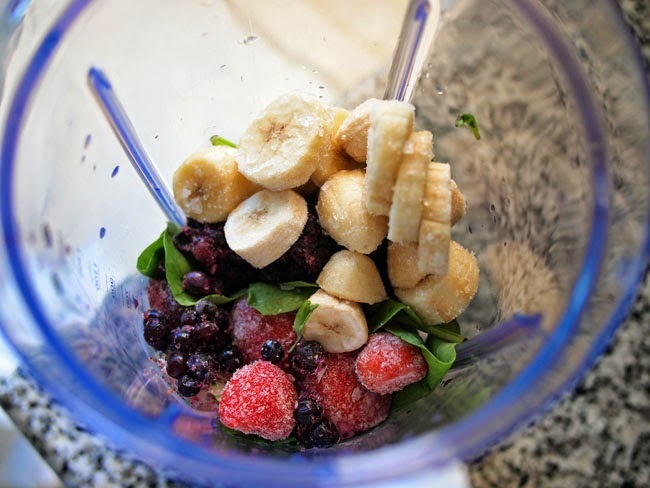 When there are summer-like temperatures every day of the year, it is always smoothie weather. I make myself a smoothie pretty much every morning. Usually it's strawberry-banana with spinach (it turns it sort of an ugly color, but you can't taste it). I buy frozen strawberries, cut and freeze my banana and use fresh baby spinach leaves. 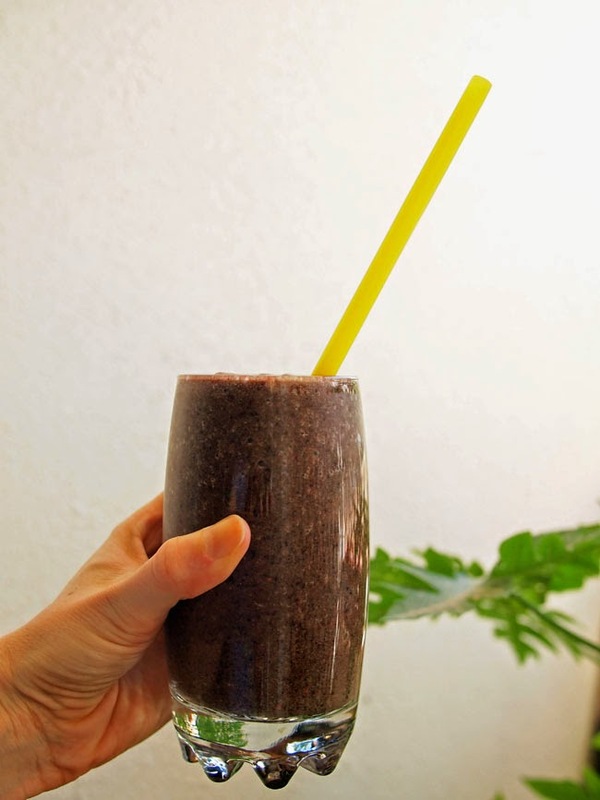 Add a splash of OJ, blend it up and I have a cup of fruity goodness in a matter of minutes! When I can get other types of fruit for cheap, I mix it up a bit. Sometimes the supermarkets have a "mango fiesta" so we buy loads and freeze them (Bryn loves a mango lassi). If we have kiwi fruit in the house I'll add one of those. On rare occasion I'll splurge on frozen raspberries or black berries, but they are soooo expensive here. Bryn had gotten me some frozen blueberries so I used them in this morning's smoothie, giving it a nice purple color! Other good add-ins are a squirt of coconut oil or even a bit of ground flax seed. Adding avocado will make it extra creamy (but I sort of think it's a waste of a good avocado). I've also tried it with kale, but I didn't care for the flavor it added. Like I said I like to add orange juice as my liquid. I'm not a milk person, and I find that water just waters it down. During our shopping trip for the week I found coconut water and bought it on impulse, then decided to use it in today's smoothie. It did change the flavor a bit, giving it a tropical coconutty vibe, but I think I'll stick to OJ in the future. 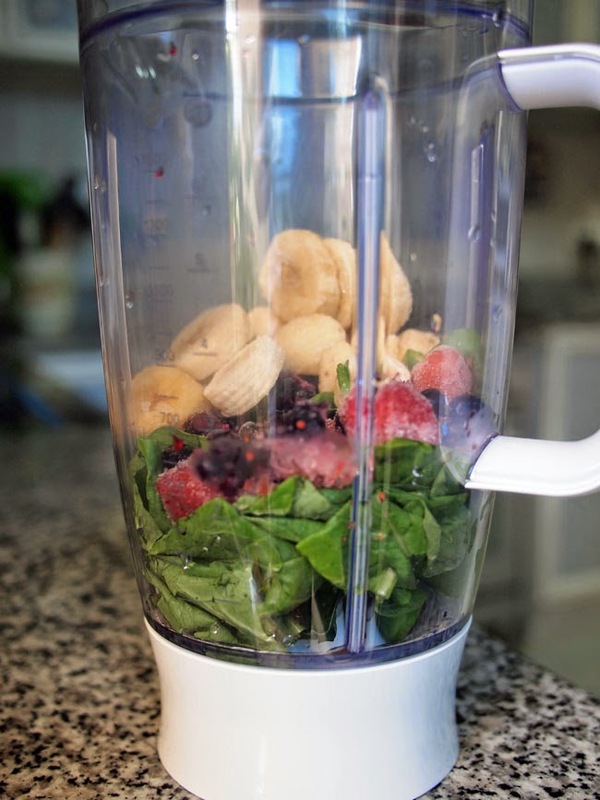 Smoothies are so easy and quick to make, and a good way to get lots of fruit and even vegetables into your diet without even trying. Yeah, some people say there's too much sugar, but you know what? I figure it's better than eating a candy bar or bag of cookies! 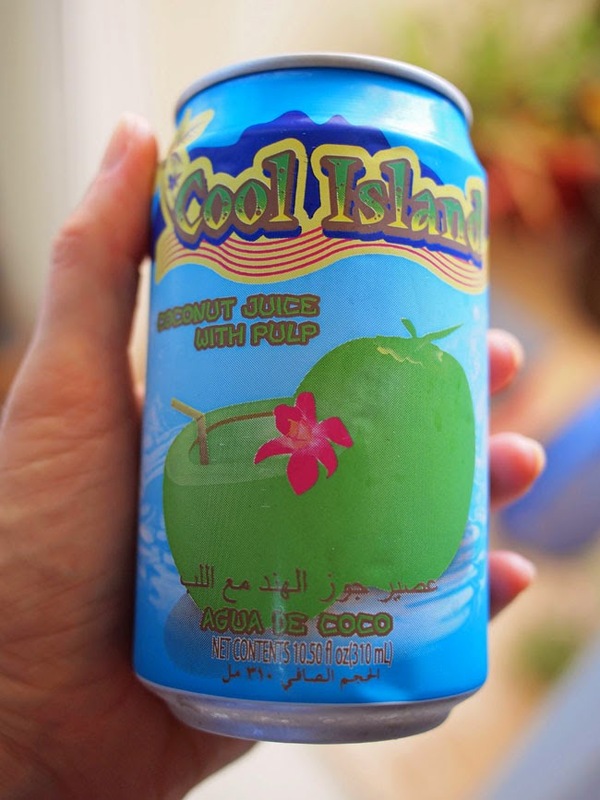 On another note, I spotted this drink at the store, right next to the coconut water, and it had to be tried. 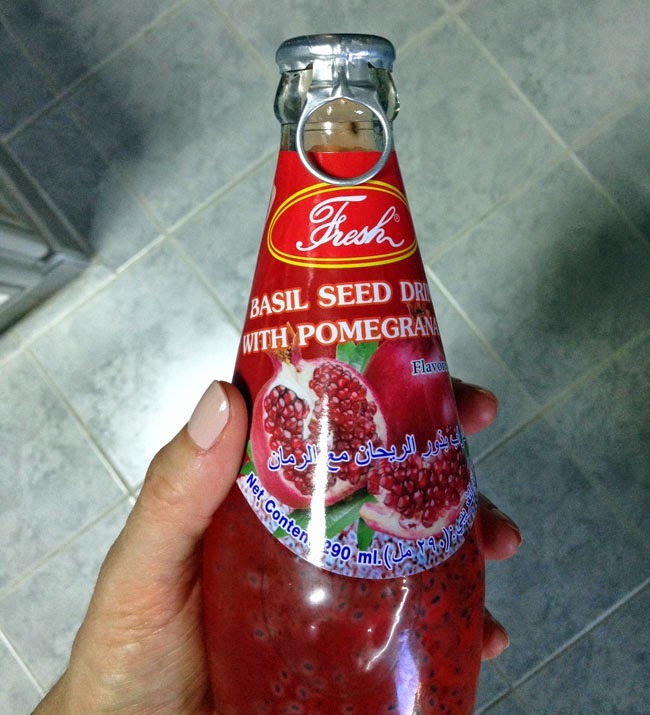 Basil seed drink from Thailand! It had little bits floating in it, and reminded me of that Orbitz drink that was so cool when I was young (do you remember it?!?) They had all sorts of flavors - normal ones like apple and mango, and more foreign flavors like aloe or lemongrass. I chose pomegranate. I was prepared for something very strange, but it was actually pretty good! It was quite sweet (I'm sure it's packed with sugar) and the basil seeds were like little balls of jell-o. Apparently they are similar to chia seeds in consistency, but I've never had chia seeds so I can't vouch for that. I did a quick google search on basil seeds and apparently they are really good for you. According to the internet (lots of different sites) they aid in digestion, help with colds and relieve stress among other things...who knew! Maybe I'll have to harvest some seeds from our basil plants to add to my smoothies!